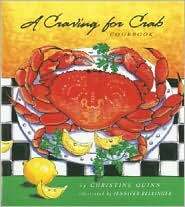 In her book A Craving for Crab (2005), cookbook author and cooking instructor Christine Quinn offers a step-by-step guide on selecting and cooking crabs. Also included in the book are crabbing adventures, information on on-line resources, and a list of crab festivals around the country. One reader says: "I've just completed reading Christine Quinn's A Craving For Crab. I say reading because much of this superb cookbook reads as if it were a novel... a well illustrated novel. Ms. Quinn introduces us to her life, family, friends, crab rustlers and all things CRAB. A thorough discussion of North American crab species is fascinating. Seventy or more excellent crab based recipes are presented including regional favorites and step by step instructions on successfully hosting a crab feed..." Christine Quinn lives on Bainbridge Island where she says she can view the crab pots from her kitchen window.